Sources have passed along an image what appears to be the european iPhone announced for December this year. Remarkable details: it has a physical keybord! It has skype pre‐installed! They got rid of the ridiculous weather application! It has a finder icon, that probably means you can install own OSX applications! Thanks, Steve, finally this rocks totally. Someone had the same idea. Yes, of course, the screen should rotate when the keybord is pulled out. I don’t think a physical keyboard would rock. I think the one it has does. I bet after some time to get used to it you can type very, very fast. Faster than on any physical keyboard of a similar size. It would be very thinker. I would not like that. Future is keyless. I’m with you on the Keyboard and other enhancements that would make the iPhone „perfect” (and nice execution BTW). Many users say they don’t miss a keyboard, which is fine, but I think for everyone who feels that way, there are a few folks who would like to have a physical QWERTY. If nothing else, it displays the FULL screen in horizontal view as you would be typing. I don’t think we’ll see something like this from Apple. But Google phone maybe? PS, if the future is keyless, all laptops and PC’s will be keyless. I’m not convinced of that. Not yet. 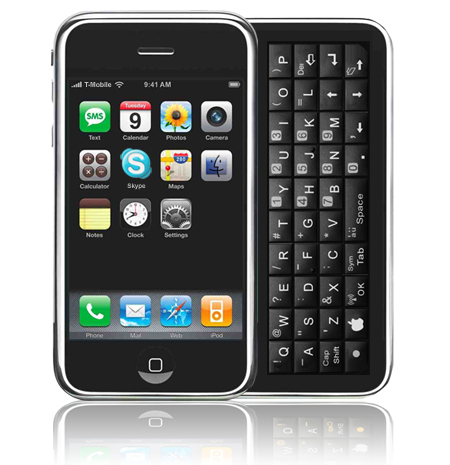 @ david: it’s a keyboard from an htc windows mobile phone:) I agree, we’ll never see that from apple. Sad.